RT Booklovers Convention & a couple of sales! If you’ve never gone to the RT Booklovers Convention, then you have been missing out as an author or a reader. Let me just say these people know how to put on a conference and several parties! By Saturday everyone was exhausted including yours truly! I also had the extreme pleasure of finally meeting fellow Bluestocking Belle Elizabeth Ellen Carter and her wonderful husband Duncan who came all the way from Australia! 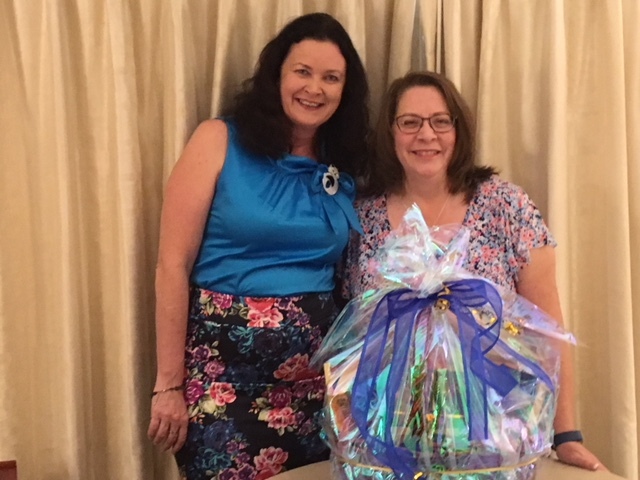 One lucky winner won this book filled basket from the Belles! Although the couple who ran this marvelous conference are retiring much to our dismay, a lot of the people who worked with them will be picking it up. Booklovers Con will be held in May 2019 in New Orleans of all places. Now that will be one heck of a party! If you stopped by my table at the book fair or got some of my swag at the FAN-tastic Day event last Saturday, I offer you a big thank you! I’m always thrilled to meet my readers and even get to introduce myself to those who have never read my books. With that being said, in case you weren’t aware, I had a sale going on with two of my books for RT that I’m going to extend through the upcoming Memorial Day weekend. Nothing But Time: A Family of Worth, Book One is currently free at all online retailers and I’ll keep it that way through Monday, May 28th. You can find more info along with the buy links on my website here. When I wrote Gwendolyn and Neville’s story, I had no idea of where it was going and how I could delicately touch the taboo subject of infidelity. And in case you didn’t notice, Gwendolyn Worthington is a descendant (several generations removed of course) to Amiria and Dristan from If My Heart Could See You. 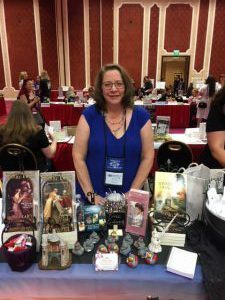 I had a lot of fun linking my Knights of Berwyck to my Regency series. I hope to have book two out this summer! 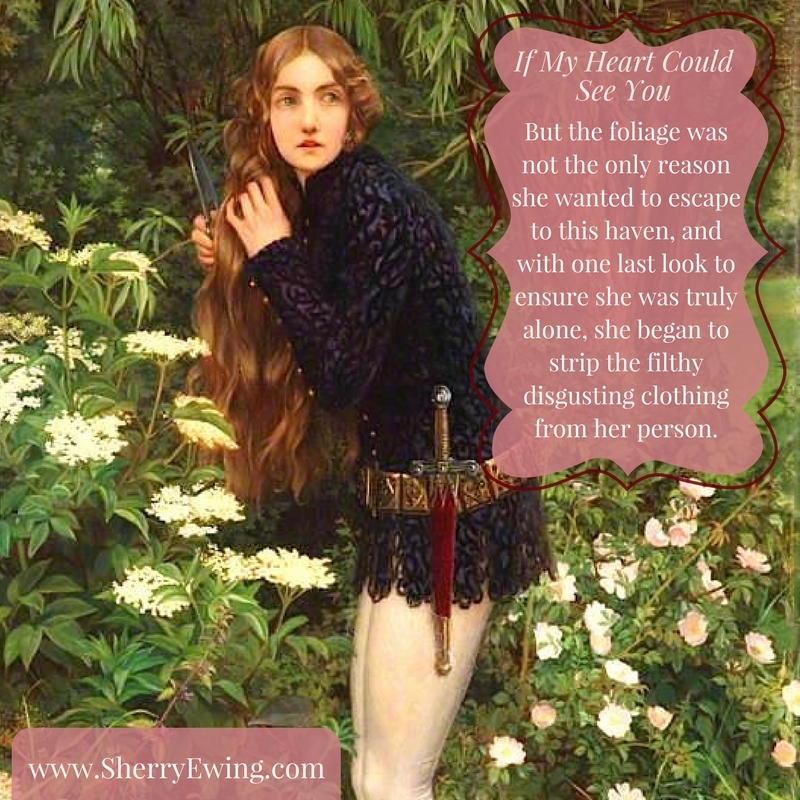 And speaking of my medieval romance If My Heart Could See You, I still have this novel (along with the whole series) #FREE in Kindle Unlimited. The good news is I also will keep this book up for sale at $0.99 through May 28th. If you haven’t read my books, this is the place to start! You can find the links on my website here. So until the next time, I hope you all have a wonderful holiday weekend. Happy reading and thanks for all your suppor! Hello, my lovelies. Today on First Kiss Friday I’m hosting myself and Nothing But Time: A Family of Worth, Book One. In case you haven’t seen this recently on Facebook or Twitter, I currently have Gwendolyn and Neville’s story as a #FREE eBook. I’m celebrating being at my first RT Booklovers convention this week and getting reading to release One Moment In Time: A Family of Worth, Book Two, this summer. So sit back and happy reading. Enjoy! Excerpt: “Tell me of yourself,” Neville asked, before taking a sip of his wine. “I would not have our conversation upset you, Gwendolyn. You need not speak of your marriage,” Neville replied, reaching across the table for her hand. His hand continued to hold onto hers and she gave up any further protests that may have spilled from her lips. They would have been falsehoods and there was no sense lying to the man who was tearing down the last defenses to her heart. “We have nothing but time this night, Gwendolyn,” he murmured, leaning forward he pressed a kiss upon her temple. Gwendolyn leaned her head upon his shoulder and he put his arm around her. Safe. He was like a boat anchor keeping her grounded whilst the waves crashed against the shore, attempting to pull loose the ropes that would keep her moored to a dock. Yet, the reality of her life remained with her and her conscience would not let go of the values she had adhered to all her life. She leaned back to look up at the most handsomest man she had ever beheld. “I cannot become your mistress, Neville,” she confessed. He stroked his hand through her hair so gently she almost burst out into tears at the injustice of it all. “I know,” he whispered, before leaning down to give her their first kiss. How could she have known just one taste would make a simple kiss so meaningful? How could she have known a kiss could be so pleasurable? How could she have known her life would change forever in the instant their breath mingled as one? She had changed, and she now knew what everyone spoke of when they said they were in love. Love… she had fallen in love with Neville the moment she had first seen him. However in the world would she live without him? More importantly, how was she supposed to return home to a husband she could not help but hate? Neville held Gwendolyn in his arms and swore he wished never to let her go. He deepened their kiss and a fire erupted in his loins he would be hard pressed to put out. If she only knew what she did to him with the simple gesture of cupping his face, she would have run from her brother’s house and never looked back. What had they gotten themselves into? He broke off their kiss and disappointment flashed in her eyes. “Do not stop, Drayton,” she murmured seductively. Neville groaned and gave in to her demand. How could he not, when she begged him for another kiss? He pressed her down so she was lying on the settee, but when their bodies molded together as one, her eyes flew open wide. There was no way to hide his arousal pressed intimately against her. The grin he gave her must surely appear wicked. If he did not know better, he would have said her reaction was virginal, but surely that could not be the case? She was a married woman and must know what she was doing. Unless… he had never heard of Sandhurst keeping a mistress, and thought the first Lady Sandhurst had died in childbirth, there were rumors that she had a lover. Yet the tiny whimpers he heard deep in Gwendolyn’s throat suggested she was familiar with passion. Or was that merely her reaction to being with him? Neville pressed himself against Gwendolyn once more to test his theory. A gasp escaped her and she pushed against him until he sat up. On sale for #FREE for a limited time! When Lady Gwendolyn Marie Worthington is forced to marry a man old enough to be her father, she concludes love will never enter her life. Her husband is a cruel man who blames her for his own failings. Then she meets her brother’s attractive business associate and all those longings she had thought gone forever suddenly reappear. A long-term romance holds no appeal for Neville Quinn, Earl of Drayton until an unexpected encounter with the sister of the Duke of Hartford. Still, he resists giving his heart to another woman, especially one who belongs to another man. 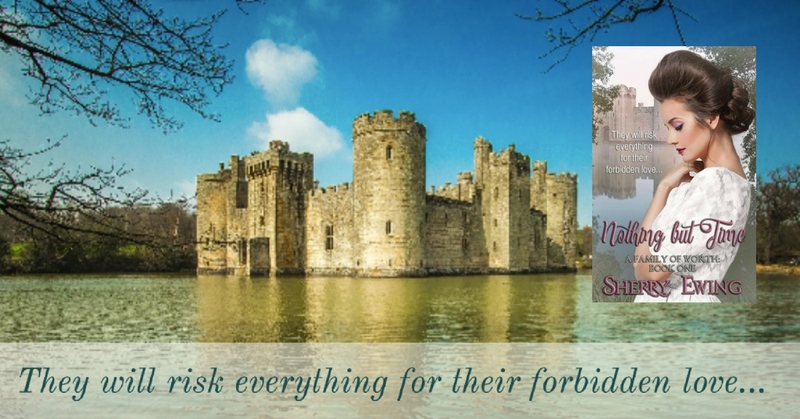 Chance encounters lead to intimate dinners, until Neville and Gwendolyn flee to Berwyck Castle at Scotland’s border hoping beyond reason their fragile love will survive the vindictive reach of Gwendolyn’s possessive husband. Before their journey is over, Gwendolyn will risk losing the only love she has ever known. Welcome to another First Kiss Friday. 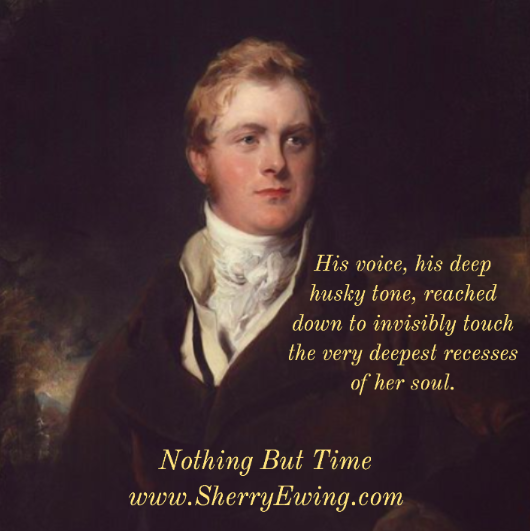 Today I’m featuring… well… myself and my first kiss scene between Neville Quinn, Earl of Drayton, and Lady Gwendolyn (Worthington) Sandhurst from Nothing But Time: A Family of Worth (Book One). In this scene, Gwendolyn’s younger brother Brandon has arranged for her to meet Neville and have a quiet dinner together. Such a mischievous brother, right? Happy reading and enjoy! The door shut behind him, leaving her alone with Neville. The draperies to the room were closed allowing the outside world no admittance to the intimate setting within. She shivered, not from fear, but more that she was actually here… with him. “You came,” his throaty words, uttered softly in her ear, had her resisting the urge to lean back into his body that was almost touching her backside. “Yes, I came. I know I should have remained at home, but here I am.” She turned to face him. “Nor I you, Neville.” She could feel her eyes glistening over with unshed tears. The warmth of his hand in hers was almost her undoing. Until this very moment, she had not been aware how much she craved even the gentlest of touches from another. “Really? Obedient? Such a vow could land you in trouble, my lord,” Gwendolyn teased. Neville held out her chair and Gwendolyn sat down into the cushion. His hand came to rest lightly upon her shoulder and she reached up to give it a slight squeeze. He went to the sideboard and began putting an assortment of food upon their plates before setting hers at her place on the table. With the wine poured, they began to eat in silence for several minutes, each lost in their own thoughts. “Tell me of yourself,” Neville asked, before taking a sip of his wine. You can learn more about Nothing But Time by clicking on the Book tab above. Thanks for stopping by today and be sure to leave me a comment! I hope you enjoyed this excerpt. Today I’m celebrating the release of my newest book: Nothing But Time, A Family of Worth Book One. This prequel has been a long time in the making in preparation of publishing the release of the very first manuscript I ever wrote, One Moment In Time, which will feature Gwendolyn’s brother. You can find more information on Nothing But Time on the tab above or here. Enjoy this short excerpt of Gwendolyn’s thoughts when she first see Neville Quinn, the Earl of Drayton. I hope you enjoy my newest novel and thank you for your support. Gwendolyn peeked through lowered lashes at the man who had held her attention. She had not meant to be caught staring at him but she could in no way pull her gaze from his. With a single glance, her heart fell, silently crying at the injustice of it all. No man should be so handsome, nor should she experience a connection with a complete stranger clear on the other side of the room. She gazed into the depths of her tea wondering if perhaps it was laced with something that caused her infatuation with a stranger. She had watched his companion leave their table and Gwendolyn needed to stifle a satisfied smile the moment he was left alone. His clothes suggested he was wealthy, for they were immaculate. His hair was a deep rich auburn and she could see where the light of the dining room reflected the hints of red within the depths of his locks. His eye color could not be determined from this distance but that did not matter in the least. He was the first man who had ever made her heart flip end over end. Such an emotion certainly never happened with her husband and she knew it ever would.